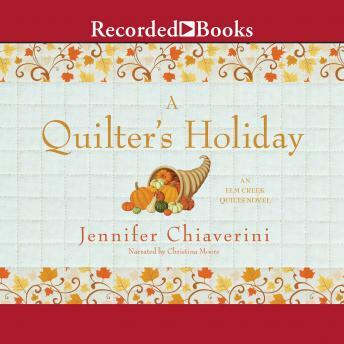 The Elm Creek Quilters are home for the holidays in this heartwarming Christmas story from New York Times bestselling author Jennifer Chiaverini. For the Elm Creek Quilters, the day after Thanksgiving marks the start of the quilting season, a time to gather at Elm Creek Manor and spend the day stitching holiday gifts for loved ones. This year, in keeping with the season's spirit of gratitude, Master Quilter Sylvia Bergstrom Compson Cooper is eager to revive a cherished family tradition. A recent remodeling of the manor's kitchen unearthed a cornucopia that once served as the centerpiece of the Bergstrom family's holiday table. Into it, each Bergstrom would place an object that symbolized something he or she was especially thankful for that year. On this quilter's holiday, Sylvia has invited her friends to continue the tradition by sewing quilt blocks that represent their thankfulness and gratitude. As each quilter explains the significance of her carefully chosen block, stories of love and longing for family and friends emerge-feelings that are also expressed in the gifts they work on throughout the day. An early winter storm blankets Elm Creek Manor in heavy snow as the quilters find new meanings in their best-loved traditions and new reasons to be thankful. A Quilter's Holiday is a story of holiday spirit, in its truest, most generous sense.